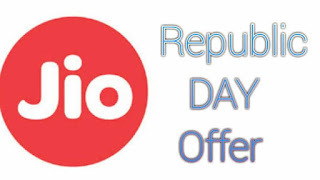 Today Is Republic Day India Reliance Jio Announced His "Jio Republic Day Offer" In This Offer Jio Had Made Some Changes In Previous Offer And Make Previous Offer to More Batter. Here is Full Details of Jio New Plan. Jio Add Two New Plans As The Part of His New Republic Day Offer. Jio Previous Paln 299 & 509 Now Give More Data And More Benefits. In Jio Previous Plan 299 Recharge You will Get 2GB Per Day But Now It's Increase So you will Get 3GB Per day In This new Jio Offer. Previous Plan In Jio 509 Plan You will Get 3GB Per day. Yes It's Increase in this new jio recharge offer you will Get 4GB Per day In 509 Rs Recharge. 0 Response to "Reliance Jio Republic Day offers | Jio New Plan"